Happy Monday! Sorry I have been so MIA these past two weeks. It has been a crazy time for me with completing major DIY projects at my new place and moving out of my first apartment. Now that I am all situated, I am back and ready to share a ton of content i've been working on for the holiday season! 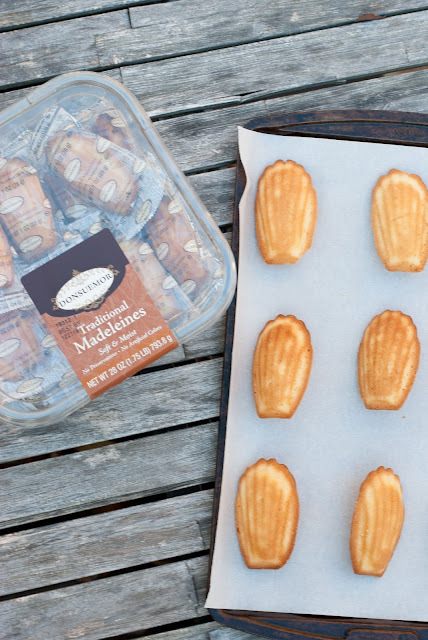 Today I wanted to share with you an easy chocolate dipped madeleine recipe using my favorite French-inspired baked goods brand, Donsuemor. This recipe is super simple and the dipped chocolate and powered sugar adds a little extra handmade love to each madeleine. Also, you can now buy these in a 28 oz box (shown below) at Costco. Since they are individually wrapped they are perfect for a little something sweet on the go or to add to your lunch during the work day (or for those with kiddos!). They would also make great holiday gifts for clients or loved ones! 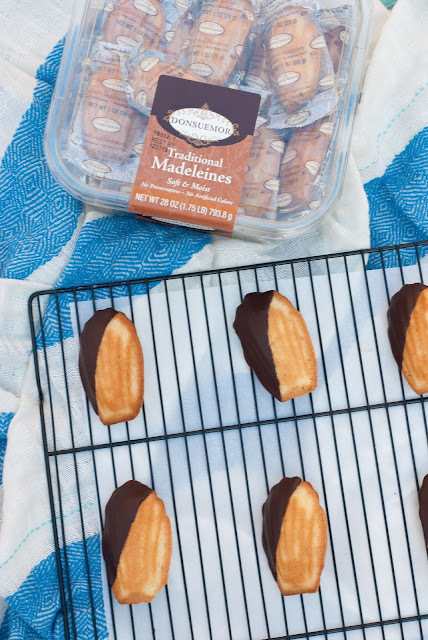 Now, time for the chocolate dipped madeleine recipe! If you prefer the recipe in a recap, scroll all the way to the bottom. First start out with a box of the madeleine cookies. You can use however many you are needing at the time, but I used 9. Line a baking sheet with parchment paper and lay your cookies out on top to flatten the parchment paper. Next, using a double boiler melt 4 oz of dark chocolate until smooth and creamy. Once melted, remove from heat. Dip each madeleine into the melted chocolate, I wanted to do mine at an angle but you can dip them however you want. Then, place them back onto the parchment paper and repeat with the remaining cookies. Once all cookies are dipped, place the baking sheet into the freezer for 15-30 minutes or until chocolate is hardened. Remove the madeleines from the freezer and sift 1/2 TBS powdered sugar onto the cookies (more if you'd like). Voila! 1. Line a baking sheet with parchment paper and lay your cookies out on top to flatten the parchment paper. 2. Using a double boiler, melt 4 oz of dark chocolate until smooth and creamy. Once melted, remove from heat. 3. Dip each madeleine into the melted chocolate, I wanted to do mine at an angle but you can dip them however you want. 4. Place them back onto the parchment paper and repeat with the remaining cookies. 5. Next, place the baking sheet into the freezer for 15-30 minutes or until chocolate is hardened. 6. Remove the madeleines from the freezer and sift 1/2 TBS powdered sugar onto the cookies (more if you'd like). 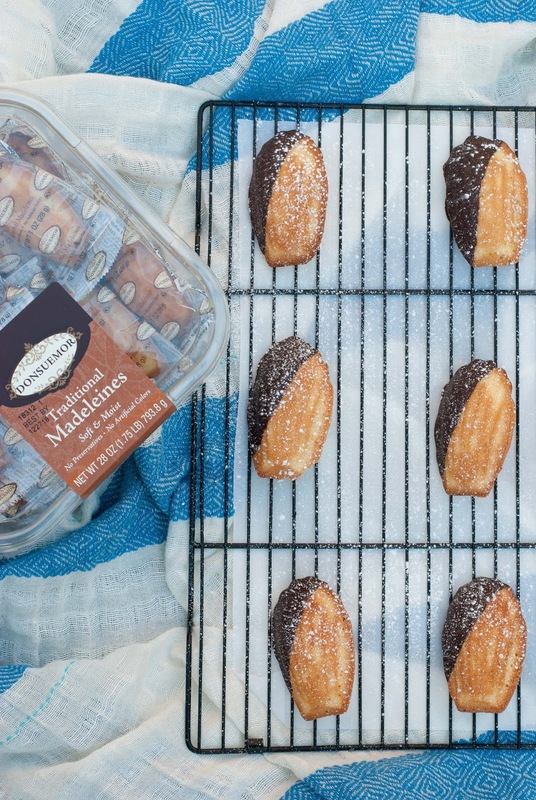 Time to enjoy your easy and delicious madeleines!